9 June 2003--Ask anyone who’s ever worked in any editorial endeavour, be it consumer or trade, print or electronic, advertising or public relations, and they’ll tell you that the hardest thing to write is a good headline. 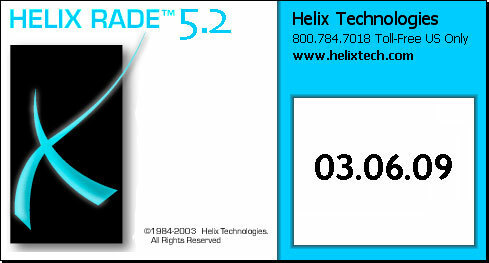 As the excitement of the 5.2 pre-release upgrade frenzy gave way to the grinding reality of having to build, write, post and crank out installers, release notes and everything else that goes along with putting out a new version of Helix, it became clear that writing a headline for this page wasn’t what we needed at all. We needed a picture--and we all know what a picture is worth. The thousand words in this picture are about numbers. 03.06.09. June 9th, 2003. Helix 5.2 Another convenient numerical port in the Helix storm, this time signifying the passage of a year since the "June 10th Adventure" began. A year ago we set out to right a shaky vessel. After taking a battering for several months in stormy seas, we had fairly low expectations. Yet in our hearts, we yearned to do right by the dwindling legions of Helix people who had suffered so long from insult piled upon injury. One year ago, after spending a long weekend preparing to switch the lights back on in the Helix tunnel, we headed off to sleep on this night, hearts filled with hope, yet with no idea what to expect. The next morning, we were deluged with goodwill. Almost instantly it became clear that simply by striving to avoid the mistakes of the past and doing the things we always believed would work, we could steer clear of further harm and out into calmer seas. Doing simple things, like answering the phone, responding to Emails and posting information on the web site yielded powerful results. And a mere two months later, we were contemplating something that had seemed unthinkable for nearly a year: continuing the development of Helix. So here it is: Helix 5.2. Another big step on the road to Helix 6. An anniversary present from the Helix Recovery Team to the faithful among you who have sustained this effort by putting your trust in people who really have put the best interests of Helix first. Thank you all for staying with us. We think you’re going to love using Helix 5.2, and we hope it will keep this ship going until it reaches the shores of Helix 6. We still have a difficult journey ahead of us, but never forget: trust works.